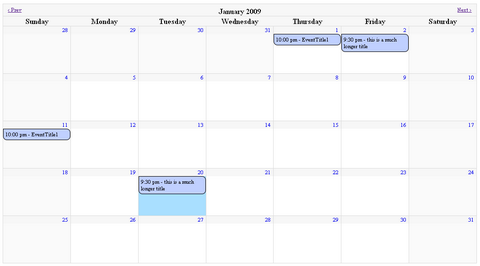 FullCalendar is great for displaying events, but it isn’t a complete solution for event content-management. Beyond dragging an event to a different day, you cannot change an event’s name, time-of-day, or other associated data. It is up to you to add this functionality through FullCalendar’s event hooks. One of the most common requests from clients when it comes to WordPress personalization, is to add a basic event calendar to their website. Finding a good place to position a big table like a calendar within your WordPress template is always a taught work. In addition, the <table> tag itself is often quite difficult to style in a good way. 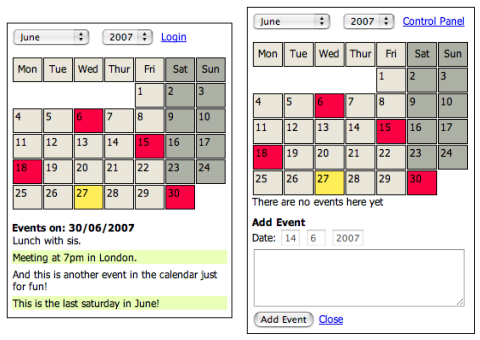 Therefore, Stefano Verna came up with astonishing iCal-like calendars with jQuery. All the magic takes place with some ninja CSS. In addition to the plain calendar structure, You can see a lightweight Coda-like effect for events description popup as well. Setting up the Calendar System is easy. Simply copy the entire calendar into whatever directory you want. Create your database and import the “databaseSQL.sql” file into it, this will create the default data for running it. And then, alter the “databaseConnection.php” file to show your connection details.That should be it. jMonthCalendar is a full month calendar that supports events. 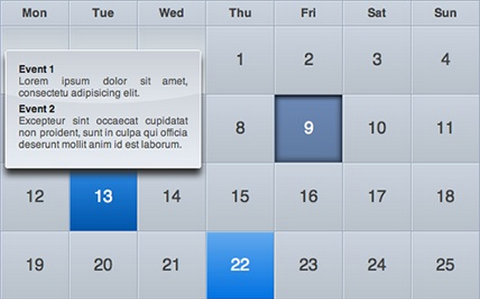 You simply initialize the calendar with options and an events array and it can handle the rest. It is compatible with jQuery 1.3.0.
jMonthCalendar has extension points that allow the developer to interact with the calendar when the display is about to change months, after the display has changed months and when the event bubbles are clicked on. By default the events would each have a URL supplied that would link to a details page. I love the idea and how it works. You can check the demo here. However, this project is experimental and in its very early stage, so there is probably still a handful of bugs to fix. Please feel free to give him some feedback. ClockLink provides fashionable yet free online clocks made from Flash that can be easily embedded in your web page or in your blog. All you need to do is simply paste the tag on your web page. You can choose a time zone for your clock so it will show the correct time, and they also provide a variety of selection, including Analog Clocks, Digital Clocks, Count Down Clocks, Count Up Clocks, World Clocks, and many more. Decorate your website or blog with ClockLink’s clocks now.